This spiced up version of chicken salad is based on the Moroccan dish, bistilla, often made to mark special occasions. It features simple ingredients, transformed by cinnamon, ginger and turmeric into a richly flavorful dish. Orange and golden raisins add sweetness to savory chicken breast. And forget about the mayonnaise; this unique dressing is made with orange juice, olive oil and an abundance of spices, making this a flavorful and low calorie entrée. 27 g protein, 2 g fiber 319 mg sodium. Halve eggs. Place 1 yolk in small bowl and set aside; discard second yolk. Coarsely chop egg whites and place in medium mixing bowl. 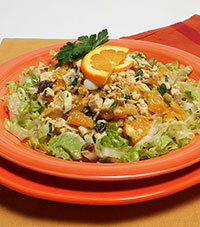 Add chicken, orange, almonds, raisins and 3 tablespoons parsley to egg whites. Using fork, toss to combine. For dressing, mix orange juice with egg yolk, mashing to combine. Whisk in cinnamon, ginger, turmeric and salt until blended. Add 4-5 grinds of pepper. Whisk in oil. Pour dressing over chicken mixture and toss with fork to combine. Let salad sit at room temperature for 30 minutes before serving to allow flavors to meld. Turmeric gets its characteristic yellow hue from a class of cancer-fighting compounds referred to as curcuminoids. The most abundant of these compounds is curcumin, which is being studied for its role in cancer prevention.